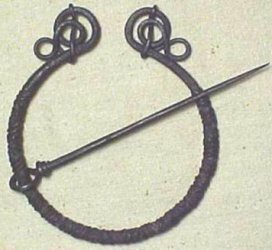 Cloak Pins come in all sorts of sizes and shapes like penanylar broches to a fibula. I knew a guy he mad a nice quilted semi-circular cloak and sewed a pair of button holes were the pin would go through the cloak. But first he'd gone to the hardwear store and bought a galvinazed nail and a galvinized welded ring. Now he puts on the cloak and pokes the two layers between the buttom holes through thet ring and passes the nail through them. Ta-da instant cloak pin and it looks so cool. Most often used are some kind of Pen-Annular Broch or almost round broch. Not having a closed ring alows the pin to be atached to the almost ring so you don't lose it, I have a few nice rings but the matching pins are gone. Some pen annular broches are big hevily ornamented afairs and others are very simple, and amazingly enough they all work just fine. I knew another fellow, he used to use a stricing steel as the ring part of his broch he kept a flint in a tinder box in his sporn. 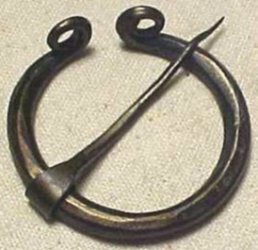 when a fire was needed he'd bull out the box and take off his cloak pin, leving the pin in his claok. Then a couple seconds later there would be fire in his hand, well the box actually. And This one was also a gift for the same reason. It was made in sweden and is about as big as youe would ever want a cloak pin to be, the ring is three and a half by four inches overall and the pin is just about five inches long. I like it a lot.